A natural solvent made from pure ingredients which is pH neutral and contains no CFC's or aromatics. It is non-flammable and non-toxic. Easily removes fresh oil paint from all your brushes, sable, sable mix, synthetic or bristle. It can even remove dried paint. 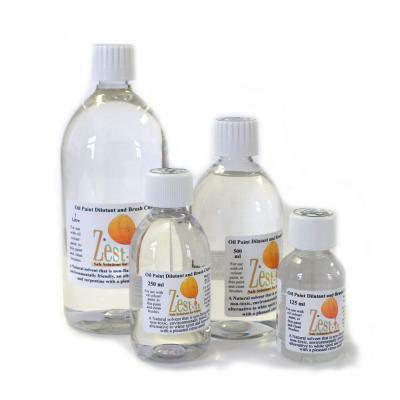 Zest-it is reusable, just let the sediment to settle out and re-use. Can also be used as a painting medium/Oil paint dilutant. For more information on this product visit our product info page. Also see Health & Safety Information.